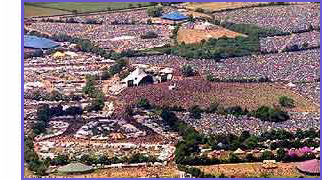 Posts: 1434 Thousands of people were delayed leaving the Glastonbury Festival on Monday because of bad weather. Cars and camper vans got stuck in the mud as the rain continued to fall, and tractors were drafted in to tow vehicles out of the car parks. Police handed out 3,000 space blankets to those trying to get home, and the Red Cross were treating queues at the railway station at Castle Cary. It was also reported that some buses had failed to turn up. One concerned mother said: "My son was on a combined ticket with coach and has spent nearly seven hours waiting in the cold and rain without shelter for a coach back to Colchester in Essex." No one from the Glastonbury Festival Office was available to comment. Festival organiser Michael Eavis said there was nothing more that could be done to get people off the site. He said that anyone in real difficulty could go to the welfare centre, that the campsite was "going strong" and the situation would eventually be resolved. Several thousand people plan to camp at the site overnight, as has happened in previous years. One reveller, Naomi Salmon, said she had only moved 200 yards in more than eight hours trying to drive off the site. "No one has told us what is going on and we've only had one burger and a bottle of diet coke all day," she said. "Everyone's getting stuck in the mud. They are bumper to bumper." A spokesman for Avon and Somerset Police said: "Police at the festival are working with the organisers and Mendip District Council to help ensure the welfare of festival goers leaving the site. "Provisions and contingencies between all agencies involved in the festival are being used to ensure festival-goers have as quick and safe a journey home as possible. "Should their wait become longer, further contingencies are in place to ensure their welfare." A spokesperson for the council said it was expected that all the car parks would be clear by mid-evening, and that those people travelling by train and bus will also have left by then. Traffic around the site is reported to be busy, but moving and motorists are advised to avoid the area if possible. Later on Monday, a train carrying passengers away from the festival was delayed after hitting a branch of a tree which fell on to the line in Wiltshire. Passengers reported hearing a bang before the train suddenly stopped.